The Sanitarium Playground (far better known to generations of kids as Soupy Island) has been giving city kids a place to play in the fresh air for forever. How forever? Since 1877, when amusement park owner John Smith a group of local doctors got together to form the Sanitarium Association of Philadelphia, which built a hospital and playground on Windmill Island in the Delaware River for kids suffering from tuberculosis. Within ten years, Windmill Island was gone, a victim of a Delaware River dredging project, so they reopened on New Jersey side of the Delaware in Thorofare. When the TB victims dried up due to better medical procedures, the association stayed open. They’d bring poor kids from Philadelphia over on the ferry. The order of the day – playtime in the fresh air on the carousel, slide, with games in the fields, and in swimming in the river, pausing only for snacks and a big lunch of soup and bread. This became especially important during the Depression in the 1930s, when up to 8,000 kids would come across the river twice a week, often for one of the only full bellies they’d have in the year (the kind folks reportedly never checked if you were coming back for a second bowl of soup). Oh, and all of this was absolutely free for the kids involved. This is the part of the post where we’d usually lament the passing of a cherished relic of the past, and I’d write something nostalgic for a place I’d never actually seen in it’s heyday. Except that Soupy Island is still there. And open. Complete with slide. And soup. So last August, one of my wife’s friends invited the kids to join her brood at Soupy Island. We both immediately smacked our heads and proclaimed, “How have we not taken the kids there yet!” and immediately agreed. And when we showed up, it was like nothing had changed. Well, not nothing. There are basketball courts now, the hospital was replaced by a pool long ago (ending swimming in the river), and the kids come from Philadelphia and Camden by bus these days, rather than ferry. But a kid wandering in from the Depression would recognize the place (and occasionally do wander in, returning with their grandkids and great-grandkids). Tuesdays are for 8 years old and younger. Wednesdays and Thursdays are for 12 years old and younger. If you are a group (many city summer camp programs come each day), you need to call ahead. If you are a family, you can just show up. The day is very regimented, and they handed us a schedule at the gate. You can get there early, but everything will be closed up save for the the playground equipment and the ball fields. Then there is snack time (milk and graham crackers). Then the carousel, slide, and pool open up. Then everything closes and its lunch time. Then everything opens up again. Then the pool, carousel, and slide close. Then the whole place closes. Graham crackers and milk for snack! The pool and carousel work on a rotational basis when its crowded. One ride on the carousel, then back in line. Twenty minutes in the pool, then the next group’s turn. Bring a roll of wax paper for the slide, it makes it super fast. Like “they would never, ever, ever, ever build one of these today” fast. First time down, neither of us were expecting the speed. But he did it like five more times, so it’s okay! Oh, and the whole thing is as free as it was for those kids in 1877. Although you should totally make a donation to help keep the place open, because Soupy Island is still running off that 1877 endowment (seriously! ), and it won’t last forever. Campbell’s soup has an unofficial partnership with Soupy Island, and their employees have put 1000+ volunteer hours in the last few years in upkeeping the place, as well as building a new playground. View of the Navy Yard across the river from Soupy Island. So 4th of July is coming, and Soupy Island will soon open up for its 140th season. Why not take the kids down for a visit? Don’t forget the wax paper! During the six weeks following 4th of July only! Zellner, Amanda. “Soupy Island: Fresh Air and Hot Soup at a Delaware River Playground“. PhilaPlace.org. Note: Includes old pictures of the place! West Deptford Patch. “Soupy Island Gets Support“. May 15, 2015. Giumetti, Deidre (aka Yummygal). “SOUPY ISLAND THOROFARE NJ ~ GENERATION AFTER GENERATION OF ENJOYMENT.“. South Jersey Explorer (blog). July 18, 2012. G, Melissa. 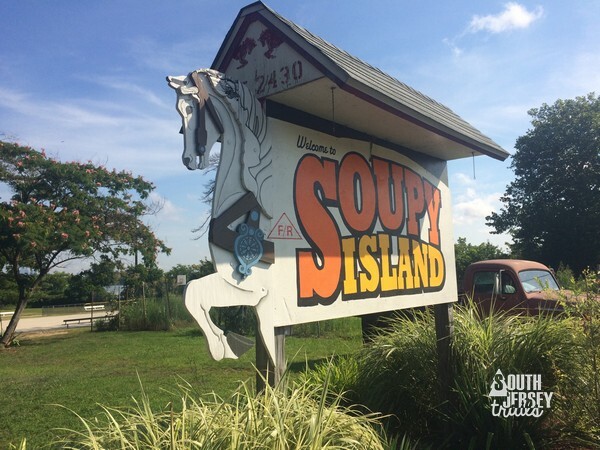 “Soupy Island a Hidden Treasure of Gloucester County.” Jersey Family Fun (blog). June 25, 2015. Romalino, Carly Q. “West Deptford’s Soupy Island was oasis for Depression-era kids.” Courier-Post. August 4, 2014. Fifield, Adam. “Soupy Island has served generations.” Philadelphia Inquirer. May 18, 2005.